Consider the luxury travel accommodations at Arbor House of Black Mountain, NC, for your North Carolina vacation. The rebuild of this 20th century home was designed by Thomas Lawton Architect. During your stay at Arbor House, you are invited to sit by the fire in the living room with its comfortable large sofa and overstuffed chairs and enjoy a good book from our extensive collection. Spread out your maps and brochures and plan your day at the large game/reading table. There are also DVD’s and games available for your entertainment. A few steps down the hall, you enter the dining area with its wood-burning, stone fireplace. Here you can enjoy a full, cooked breakfast with each day’s menu featuring an entree such as stuffed French Toast, Belgian Waffles, or muffins and delicious omelets. For the convenience of our guests, a double-butler pantry is complete with a selection of teas. 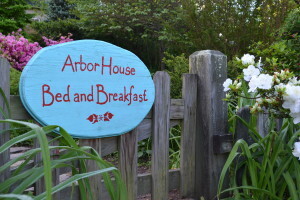 After breakfast, you can begin your activities for the day or simply relax and enjoy the gardens of Arbor House with its stone walls and arbor. Walk, sit at the wicker setae on the verandah, rock gently in the swing on the lawn, or take in the beautiful views from the back deck. You’ll be surrounded by gardens of azaleas, rhododendrons and dogwoods in the spring or large shady oaks and roses in the summer and fall. Don’t forget the binoculars since nature provides an assortment of songbirds and waterfowl around the lake. The mini-fridge is stocked with water and sodas and after your day’s activities relax on the deck or around the table with freshly baked snacks or sweets from the kitchen. We’ve anticipated your every need at your home away from home during your stay. We have two day passes for the price of one day available for Biltmore in Asheville. There are several music venues in Black Mountain. We have over 33 restaurants and 40 retail shops in our quaint town.